With modern interface software and web technology, Ink manager can be integrated seamlessly with management information systems (MIS) and ERP software. GSE aims to create standard interfaces with the leading MIS/ERP software suppliers in the printing industry. 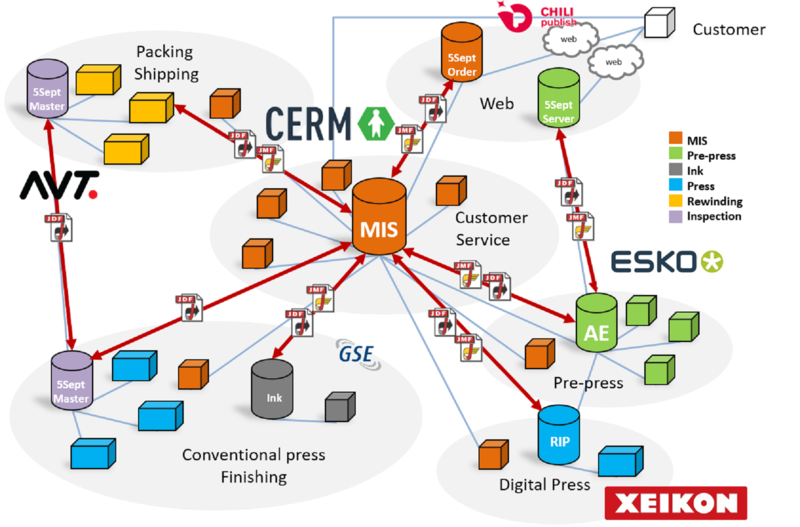 The benefit of a standard interface (“GSE MIS connect”) is a quick, straightforward implementation for a fixed price. And by concluding a support contract, you can rest assured that the interface will keep working after software updates have been installed – without extra costs. With Cerm, software solution provider for narrow web printers, we have co-developed a standard interface. It enables the management of ink requirements to be integrated within the label printer’s forward planning and scheduling systems. GSE Ink manager synchronises the ink recipes in the Cerm software, giving the scheduler an immediate overview of recipe availability. The customer service representative enters sales orders in the Cerm MIS and starts the production with an automated export of ink requirements. Cerm ink requirements and the order number are imported to GSE Ink manager and the ink job will be executed accordingly. We have developed a standard protocol to integrate with MIS/ERP software, which can be send to you upon your request. With this interface, information can be imported like recipes, production orders with article codes and quantities to be produced. This standard interface can also be offered for a fixed price. Our software engineers can also develop a customised solution for integrating MIS/ERP software in situations where a standard interface is not yet available.